Taken from The Art of Seamless Knitting: "This versatile tunic follows classic top-down construction--beginning at the neck, the yoke is worked downward to the armholes, with cable patterns centered on the front and back. A small motif from the front, centered on the reverse-stockinette background of the sleeves, ties the elements together in pleasing overall balance. Waist and hip shaping worked in the reverse-stockinette sections between cables results in a slimming hourglass silhouette. For the three largest sizes, there is an option for introducing additional cable patterns to fill in what would otherwise be large expanses of reverse stockinette." 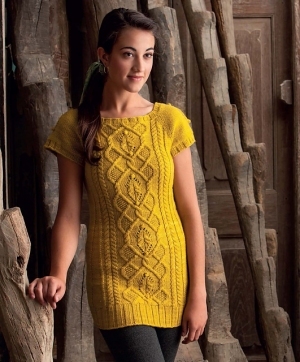 This pattern is from The Art of Seamless Knitting, pg 81 - Cabled Tunic. Size US 7 - 24" circular needles, US 7 - 16" circular needles, US 7 double point needles, US 6 - 24" circular needles, US 6 double point needles (or size needed to obtain gauge), a cable needle, stitch markers, stitch holders, and a tapestry needle are required but not included. Finished Bust Measurements: 32.75 (37, 40.25, 43.75, 48.75, 52.25, 56.25)" after blocking. Gauge: 19 sts and 32 rnds over 4". Color Shown is Frank Ochre.